By lavender at Jun. 30. 2013. We lost one of the original roses along Rose Alley last summer. Whether its demise can be attributed to the replacement of the fence posts, which were cemented in this time or to old age, is not known. It is difficult to say how old this particular bush was but it is certainly over 15 years old. 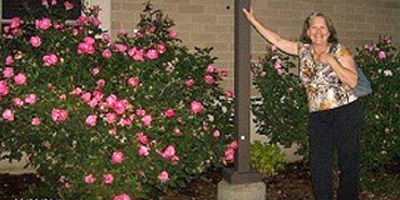 There were two floribunda roses among the multiflora roses that we put in when the Pershing Parking lot was built. The multiflora roses were removed and replaced by more manageable bushes several years ago but these two were good growers and controllable so they were left in place. garden roses are known for their hardiness and disease resistance. “Eutin” is said to be a good cold climate rose, hardy to zone 4. It is resistant to rust and mildew and its leathery foliage is impervious to fungus. It will take some shade, which is a good thing when you are planting roses near buildings. It accepts hot dry conditions and , while it will not reach its maximum potential under these conditions, it survives and produces flowers. 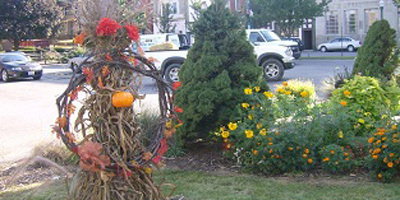 Under ideal conditions the bushes will reach 5 feet in height and will spread to 4 feet. The flowers are the outstanding quality of the ‘Eutin” rose. They form enormous clusters of up to 50 flowers. The flowers are a dark red and are double with 17 to 25 petals. While it is considered a small rose, it makes up for its size in sheer abundance. The flowers are long lasting but have very little fragrance. Best of all it is a repeat bloomer. Finding this rose was a very lucky happenstance. The roses on the Pershing lot grow under less than ideal conditions. The soil is poor, they are constantly bombarded with exhaust fumes and the persistent wind in this area dries the soil rapidly. This seems to be an ideal rose for the area. We cannot answer questions via email if you have your email blocked. However, here is the the answer to Rita’s question on propagation of the Eutin rose. I don’t have a lot of experience with the Eutin rose but the one we did care for did not sucker. Suckers are the long shoots that some roses put up at a distance from the plant. Usually they have some roots and will form another plant. These can be dug and removed from the parent plant for another bush. If a rose doesn’t sucker, and I can’t find any reference that suggests that the Eutin does, there is no easy way to propagate them. If yours does just dig up one of these rooted shoots and baby it until it has a full root system. You can do this at any time during the year but spring is probably best. You could also try rooting a cutting. 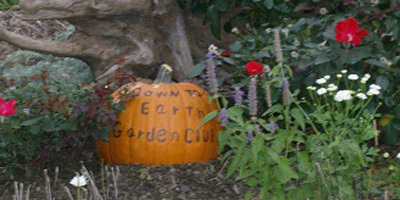 The method used by the Renzie Park Rose Garden is to take a 4-6 inch cutting with at least two nodes. One node should be near the bottom. Dip lightly in rooting hormone. Lightly, as too much will inhibit root growth. Place in a sterile medium such as vermiculite. Water and cover with a plastic one liter bottle with the bottom cut out. Keep moist and out of direct sunlight. Do several cuttings as not all will root. In reply to Rita’ question. Please remember that if you block your email we cannot answer the “contact us ” questions. Roses can be grown from seed. 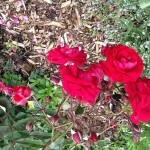 This rose is quite old and probably the seed is stable and not prone to the quirks of hybrid seed. It is another possibility. If your Eutin rose does sucker let me know. I really can’t remember seeing any suckers on the one we had and we lost it several years ago to abuse by some helpful volunteers. We replaced it with a modern Knock out rose which succumbed to extremely cold winter temperatures. At -25 degrees we lost quite a few plants. Thank you for your reply. You answer was not blocked even tho it said it was. This is the exact message I received from you at the time I requested information from you. I’m sorry it took so long to get back to you. We have some pods that look like they have seeds in them, so will try that if we can. We also have a couple of real long stems that look as though we could use them. I don’t know if they are suckers or not. I know years ago I used to transplant them from the original plants to a fence line away from the original plants. We just finished attempting both suggestions you gave me, so will see if it works. If not, do you know of any place we can get them. Earl May’s in Kearney, NE had some several years ago, but haven’t seen them since. I, too have been replacing with knock out roses. They are nice. Would rather have the Eutins if at all possible, tho. We are down to 3 and 3.